Keep yourself warm on game days with this classic Rabbitohs inspired hoodie. This cozy piece of clothing is perfect for both chilly and mild days both at the footy and out on the town. 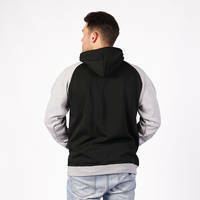 With a strong black base and grey sleeves, the hoodies’ simplistic design suits all customers. Become a member to get the special pricing of $80.96.